Whenever an event on an element is triggered, it bubbles up through all its parents till it reaches the html element. i.e If we trigger a click event on element1 then all the click events of its parents will be triggered one by one. 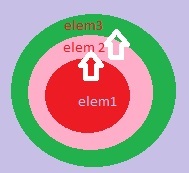 In the above diagram, elem1 click event triggers click event of elem1, then of elem2 and finally of elem3. So, if we want to check for the actual base element whose event was triggered, then we can check for event.target in all elements click event which will always return elem1 in the above example. For any query, please feel free to ask/comment.